One of the most significant eras of Czech musical history took place during the reign of Emperor Rudolf II (1552 – 1612) at Prague Castle. Rudolf inherited an outstanding court ensemble for which the most celebrated European composers of the day wrote music. 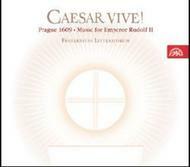 This new recording features two personalities in particular: Philippe de Monte, the emperor’s longtime musical director, and Carl Luython, an organist one generation younger and composer of the seven-voice mass Caesar Vive! The Fraternitas Litteratorum ensemble, which specializes in performing the vocal polyphony of the 15th and 16th centuries, has here created a picture of the musical life of Rudolf’s chambers and gardens, including the liturgical and sacred works of his time.